Learn how to back up Outlook folder. How to back up Outlook Folder when you needed? Backing up Outlook folder with Folder Backup for Microsoft Outlook is really simple. This software is designed to back up a selected Outlook folder manually from the Outlook toolbar with just one click when needed. During the first selected Microsoft Outlook folder backup, the program asks for a suitable backup location (in the free edition the program automatically locates the backup folder). Once the location is defined, each time when you click the “Backup” button on the Outlook toolbar or use the right-click menu, a new selected Outlook folder backup will be created without any wizards. By default, Folder Backup for Microsoft Outlook stores 5 selected folder backups, but you can change this using the Pro Edition options. 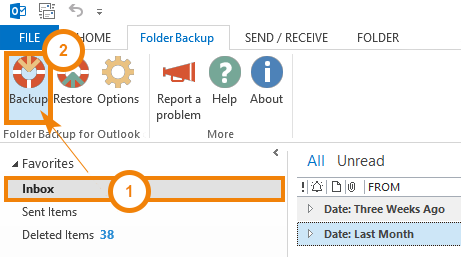 Even if you start the backup process and accidentally close your Outlook, the backup will proceed in the background and at the end of the backup process a notification will appear to inform you that the backup is finished. With this software, backups will run really fast and will take significantly less time than traditional Microsoft Outlook back up tools, because only one selected Outlook folder is being backed up. Back up email, contacts, calendar or any other Microsoft Outlook folder, which you may need to restore in the future. This software creates exactly the same copy of the selected Outlook folder instantly. It is an ideal solution for those who want to back up the exact folder data at the exact time, which can be used as a restore point in between automated computer backups, and save your time if you want to quickly reverse any changes and deletions you or some third- party software made. Back up Outlook and Exchange or IMAP folders using Folder Backup for Microsoft Outlook Pro Edition. According to your needs, your Pro Edition allows you to back up data from several folders, while in the Free Edition the user is allowed to back up only one and the same folder each time. There is also an ability to choose the number of Outlook folder backups to keep and define the total size of your backups. This will ensure that your computer won’t get overcrowded. The program allows you to choose a restore point when the Outlook backup has been made, and to filter the data you’ll restore. The intelligent restore will not overwrite all data and will only restore the folder’s items that have been deleted and will update the items that have been changed. 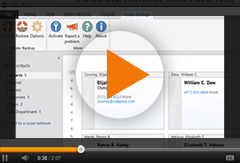 The Intelligent restore will keep your linked data intact. This is especially important for enterprise, Exchange and Office 365 users, as well as users of third- party synchronization tools for Microsoft Outlook. The competitors’ backup solutions will overwrite all existing data during the restore and that will lead to re-synchronization of all the folder’s content with the remote server, increased traffic, possible conflicts, duplicates and loss of important information, as well as other issues. Click here to learn more about the benefits of Pro Edition. How to back up Outlook folder? How to restore Outlook folder?